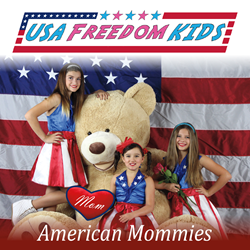 Destined to become a classic mommy-anthem, full of joyful tears, the USA Freedom Kids offer a new song "American Mommies" in honor of Mother's Day. Which comes first, the great country or the great mommy? Makes no difference. If you’re an American mommy, or have an American mommy, you (and she) will love "American Mommies" for years to come. There’s no longer a need to mail a five-dollar card that will ultimately pollute our landfills. Mom will open it and read it one time, probably taking about one-minute; and the next day, toss it in the trash. Now, in today’s technological world, you can instantly download and email (or text) her American Mommies that she’ll keep and listen to for years. And it even comes with adorable cover-art so there’s zero need for a wasteful and expensive card. You can instantly download the song, American Mommies that lasts forever for less than two-bucks. “I think one of the things that makes America such a great place is our Mommies,” chuckles Bianca, the ‘triple-threat’ 11-year-old of the USA Freedom Kids. “So we had to do a song about, well, American Mommies,” chimes in Alexis, the groups’ youngest performer. So, which comes first, the great country or the great mommy? Makes no difference. If you’re an American mommy, or have an American Mommy, you (and she) will love this song for years to come.